For centuries lighthouses have stood guard over rocky shores the world over, providing safe passage to mariners and their ships traveling far and wide for industry and commerce. Portland, Maine’s Breakwater “Bug” Light is no exception. For 141 years Bug Light has been a small yet mighty protector for Portland’s rocky coast. Surrounded by a park filled with picnic tables, it is a literal breath of fresh sea air. 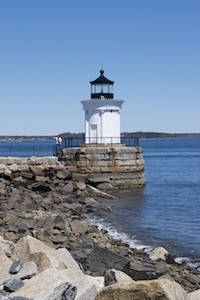 You can easily walk to Bug Light and walk around it to see Casco Bay and all the islands off the historic coast — not to mention a full skyline of Maine’s largest city. Being a desert rat from the southernmost parts of New Mexico, where the air is as dry as the sand, the sight of the Atlantic and surrounding battlements — and the small but mighty Bug Light — took my breath away. The sun was high, the grass a color of green I had only ever seen in a crayon box, and the water so blue and inviting I had a hard time keeping my shoes on my feet and my body out of the water just to make sure it was real, since mirages look deceptively real where I’m from. I kept reminding myself that I wasn’t 10, and that throwing my shoes off and running like a maniac who had never seen water before into the bay was not ladylike for someone of my age. The water temperature was around 47 degrees Fahrenheit, something I didn’t know at the time, but it was so tempting. Decorum won out in the end; after all, it is a must when strangers are around. (My husband is rolling his eyes and snorting as he reads this.) However, if I had had a kite on hand I just might have thrown caution to the wind and made the delicate fabric and stick ensemble fly with its ribbon tail dancing in its wake. The winds were perfect for it. The walk to Bug Light is an easy stroll from the parking area. Though the walkway to the lighthouse is made of granite boulders — as is much of the area bordering the sea — they were easily traversed. Walking up to the lighthouse I was taken aback by its ornate architecture. As a minor collector of lighthouse figurines, I was expecting something… larger… and more elaborate… than a cylindrical post with a light and mirrors atop with a charming keeper’s cottage attached. (Don’t you worry, Maine’s got those, too.) Bug Light is still incredibly beautiful. 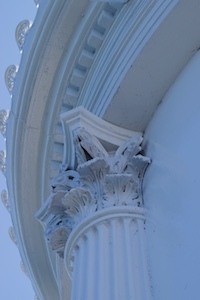 Its ornate columns are decorated at the top with Grecian-style leaves, and molding all done in cast iron make it an oxymoron in the world — as I know it — of lighthouses. From the shore, if you look right while facing the sea, you’ll see Spring Point Ledge Lighthouse. To the left you see Portland’s skyline. Church steeples dot the sky as the ferries bob along the horizon. Old and new architecture meld together for a quiet and serene view, perfect for picnics and kite flying. Benches dedicated to people who loved their time in the park dot the walkway, as people sit enjoying the quiet while eating their lunches or chatting with acquaintances who walk past. The entire area is so friendly and welcoming, yet understanding when you want time to yourself. People would call out a hello, ask if I needed help finding something, and then let me be. As I stood there admiring the “new” of the area and witnessing the “old world” contraptions still in use — granted updated with solar panels and powerful lightbulbs instead of oil, wicks, and mirrors — I couldn’t help but wonder about the area’s history. The lives saved or lost. The ships the lighthouses were not able to save. History, the vessel we use to ensure we survive and have better lives than our ancestors. Oh, what stories that little lighthouse could tell.